Samba AD currently doesn't provide support for SysVol replication. To achive this important feature in a Multi-DC environment, until it's implemented, workarounds are necessary to keep it in sync. This HowTo provides a basic workaround solution based on rsync. This HowTo describes a solution for SysVol replication based on rsync. This tool is unidirectional, this means files can only be transferred in one direction. That's why for rsync-based SysVol replication, you have to choose one DC on which you do all modifications (GPO edits, logon script changes, etc.). All other DC's retrieve the changes from this host, this is because modifications on them are overwritten when syncing. A good choice for this "master" host is the one that contains the FSMO role "PDC Emulator", because you can configure the Group Policy Management Console to connect only to this machine (default), instead of just choosing any of your DC's. You can define at „Action“ / „Change Domain Controller“ which machine the GPMC connects to. 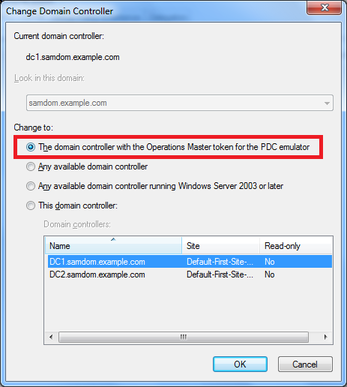 There you should select „The domain controller with the Operations Master token for the PDC emulator“ (default). If you prefer to use rsync through a SSH tunnel, you can adapt the command to your needs, but usually there's no confidential content on the SysVol share. It should be sufficient for most to use an unencrypted transfer. The rsync module on the PDC Emulator is also defined as read only, because it is used only as the source, so no content can be pushed to it. Install rsync by using your package manager or by compiling from source. Make sure that you use a version that supports extended ACL's! only_from       = 10.99.0.0/28     # Restrict to your DC address(es) or ranges, to prevent other hosts retrieving the content, too. Make sure, that you have identical IDs of built-in groups on all DCs. Install rsync by using your package manager or compile from source. Make sure, that you use a version that supports extended ACLs! Warning: Make sure that the destination folder is really your SysVol folder, because the command will replicate to the given directory and removes everything in it that isn't also on the source! You could damage your system! So check the output carefully to see if the replication is doing what you expect! If everything looks sane, run the command without the --dry-run option and let rsync do the replication. To automate synchronisation, you can run the command via cron (e. g. every 5 minutes). Repeat these steps on every DC (except your PDC Emulator!). How can I get multi-direction replication ? There is some testing using unison with rsync to achieve this. A cluster file system with Samba requires CTDB to be able to do it safely. And CTDB and AD DC are incompatible. This page was last modified on 16 January 2019, at 10:02. This page has been accessed 39,521 times.